I'm struggling with the concept of the Fatou set because its definition as the largest open set on which the iterates of a map are normal is so abstract. However, on Wikipedia I've caught mentions of "fatou domains", here meaning loosely "largest open set on which the iterates have a certain long term behavior". The Fatou set is then the union of the (disjoint) Fatou domains. For example, in this image, the three colors represent the three Fatou domains, being the basins of attraction of the three attracting fixed points. I can wrap my head around that concept much better: the complex plane divides up into disjoint open sets with dense union such that the long term dynamics are the same on each set. 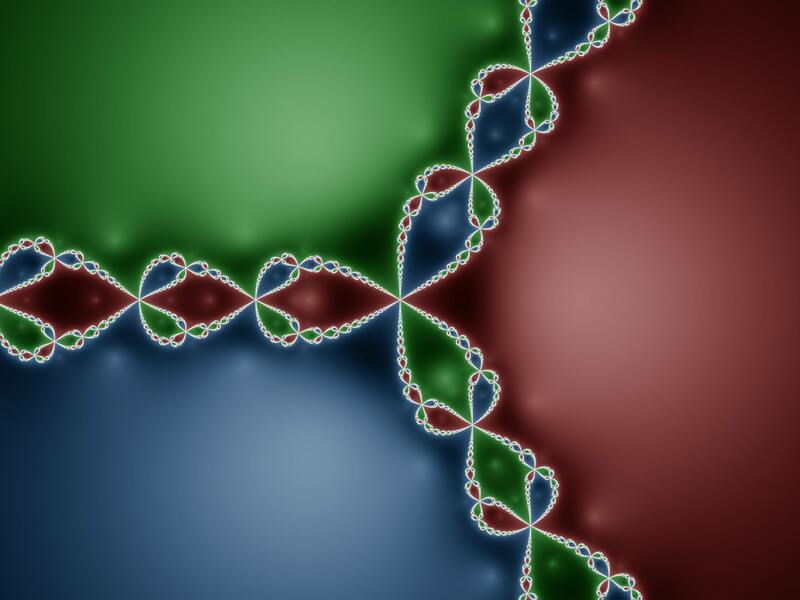 Their boundary is a nowhere dense set called the Julia set. Behavior at the Julia set is obviously chaotic since by definition, slight perturbations will put you in different Fatou domains, where the long term behavior is different. A Fatou domain is the basin of attraction of an attracting cycle. To each $z$ assign $\omega(z)$, the set of limit points of the forward orbit of $z$. Then a Fatou domain is a largest open set on which $\omega$ is constant. The Fatou set is then the union of the Fatou domains. This definition attempts to generalize the notion of basin of attraction. But I'm not sure if this is correct. Is $\omega$ constant on a Siegel disk, for example? Also, what about the Julia set? How does $\omega$ behave on that? Would it end up being a "Fatou domain" under the above definition? In summary: Can we define the Fatou set in the following way? Somehow generalize "basin of attraction" to "largest open set which exhibits a common long term behavior", perhaps using the function $\omega$ above. Call such sets Fatou domains and prove that they are open and disjoint. Establish that these sets are dense in the plane. Call their union the Fatou set and show equivalence with the standard definition. Browse other questions tagged complex-analysis complex-dynamics or ask your own question. Do holomorphic functions necessarily blow up at the edge of their maximal domain of definition? Are limits points continuous on the Fatou set? Boundary of basin of attraction of $\infty$ = closure of repelling periodic points.